Protein, Exercise, And Factors Affecting Muscle Mass. The principles behind the regulation of protein metabolism are worth knowing about… Learn more about these factors if you want to know how important protein and exercise are as you try to maximize body composition and exercise performance. The factors underlying variations in protein synthesis and catabolism, which regulate muscle mass, are complex and still being worked out. However, we have enough information now to allow us to manipulate both processes and increase muscle accretion. While difficult to understand, and even tedious at times, the principles behind the regulation of protein metabolism are worth knowing about since they underlie much of what we do in our attempts to maximize body composition and exercise performance. For example, amino acids, while important as substrates for various metabolic pathways, are also regulators of protein synthesis and other metabolic processes. Accelerated protein breakdown and a net protein loss occur secondary to exhaustive exercise and in injury and various diseases. The negative nitrogen balance observed in such cases represents the net result of breakdown and synthesis; with breakdown increased and synthesis either increased or diminished. [ Click here to learn more. ] Nitrogen Balance. 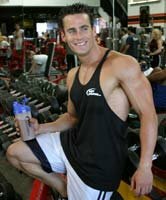 Any bodybuilder with a rudimentary understanding of the sport would know the key to gaining muscle is protein consumption. But how do we know if we are getting enough protein? Under certain conditions protein catabolism can also be decreased. As well, protein synthesis can be increased or decreased under certain conditions. The net result depends on the conditions present and the effects on both synthesis and catabolism. The rate of synthesis of the mRNA that codes for the particular protein(s) could be increased (known as transcriptional control). The rate of synthesis of the polypeptide chain by the ribosomal-mRNA complex could be increased (known as translational control). The rate of degradation of the mRNA could be decreased (also translational control). The rate of degradation of the protein could be decreased. The following table outlines some of the conditions or factors affecting protein synthesis. Many of these conditions and factors are inter-related. Keep in mind that protein synthesis is increased as the result of a net positive change secondary to changes in both (or less commonly one of) synthesis and catabolism. i. Cellular hydration refers to an intracellular state and as such is different from extracellular hydration. ii. Thyroid hormone (thyroxine and triiodothyronine) stimulate both protein synthesis and degradation depending on their levels in the body. Not enough or too much can be detrimental to protein synthesis. Higher than normal levels of thyroid hormone leads to the catabolism of protein. ** From Amino Acids and Proteins for the Athlete, the Anabolic Edge, Mauro Di Pasquale, M.D., 2nd Edition in Press. The amount of protein synthesis that takes place during and after exercise is dependent on several factors including a complete complement of precursor amino acids (both essential and non-essential amino acids), specific acetylating enzymes, tRNA, and adequate ATP levels. [ Click here to learn more. ] ATP: Energy&apos;s Currency! If one has ever wondered just how we are able to summons the energy to perform a number of activities under a variety of conditions, the answer, in large part, is ATP. While the relation of protein synthesis to the ambient concentrations of amino acids in the intracellular and extracellular pools has not been fully defined, it is possible to identify sets of intracellular amino acids that predict the level of protein synthesis, and to delineate combinations of plasma amino acids whose levels account for a significant portion of the variance in the intracellular predictor amino acids in normal human infants and adults. In one study the intracellular concentrations of most amino acids were found to be higher than their concentrations in plasma, except for valine and citrulline, which were lower. The "aminograms" in the two pools also were very different - 44% of the variance in protein synthesis was accounted for by the intracellular concentrations of leucine, glycine, alanine, and taurine in neonates, and 45% by a combination of threonine, valine, methionine, and histidine in adults. The intracellular concentrations of each of these predictor amino acids in adults were, in turn, related to different combinations of the plasma concentrations of threonine, phenylalanine, tryptophan, isoleucine, histidine, citrulline, ornithine, arginine, and glycine. The increases in intracellular amino acid concentrations seen with exercise may reflect decreased protein synthesis, accelerated protein catabolism, an increase in amino acid transport into the cell, or combinations of these conditions. For example an increase in protein synthesis would be expected to cause a decrease in amino acids but this may be offset by an increase in intracellular availability due to increased transport. As well, altered intracellular amino acid levels may directly regulate exchange diffusion of intracellular for extracellular amino acid(s). [ Click here to learn more. ] Amino Acid Metabolism! View Amino Acids Products Sorted By Top Sellers Here. Raught B, Gingras AC, Sonenberg N. The target of rapamycin (TOR) proteins. Proc Natl Acad Sci 2001;98:7037-7044. Deldicque L, Theisen D, Francaux M. Regulation of mTOR by amino acids and resistance exercise in skeletal muscle. Eur J Appl Physiol. 2005;94(1-2):1-10. Metcoff J. Intracellular amino acid levels as predictors of protein synthesis. Journal of the American College of Nutrition 1986;5(2):107-20. Wood PD, Terry RB, Haskell WL. Metabolism of substrates: diet, lipoprotein metabolism, and exercise. Fed Proc 1985;44:358-363. Gollnick PD. Metabolism of substrates: energy substrate metabolism during exercise and as modified by training. Fed Proc 1985;44:353-357. Dohm GL, Kasperek J, Tapscott EB, Barakat HA. Protein metabolism during endurance exercise. Fed Proc 1985;44:348-352. Castill DL. Carbohydrate nutrition before, during, and after exercise. Fed Proc 1985;44:364-368. Astrand PO, Rodahl K. Textbook of Work Physiology, 2nd ed. New York: McGraw-Hill, 1977. Borer KT. Neurohumoral mediation of exercise-induced growth. Medicine & Science in Sports & Exercise 1994;26(6):741-54. Goldberg AL. Influence of insulin and contractile activity on muscle size and protein balance. Diabetes 1979;28:18-24. Goldberg AL, Goodman HM. Relationship between cortisone and muscle work in determining muscle size. Journal of Physiology 1969;200(3):667-75. Goldberg AL, Tischler M, Libby P. Regulation of protein degradation in skeletal muscle. Biochemical Society Transactions 1980;8(5):497. Goldberg AL. Protein synthesis during work-induced growth of skeletal muscle. Journal of Cell Biology 1968;36(3):653-8. Goldberg AL. Role of insulin in work-induced growth of skeletal muscle. Endocrinology 1968;83(5):1071-3. Goldberg AL, Goodman HM. Relationship between growth hormone and muscular work in determining muscle size. Journal of Physiology 1969;200(3):655-66. Goldberg AL. Protein turnover in skeletal muscle. II. Effects of denervation and cortisone on protein catabolism in skeletal muscle. Journal of Biological Chemistry 1969;244(12):3223-9. Goldberg AL, Griffin GE. Hormonal control of protein synthesis and degradation in rat skeletal muscle [proceedings]. Journal of Physiology 1977;270(1):51P-52P. Kettelhut IC, Wing SS, Goldberg AL. Endocrine regulation of protein breakdown in skeletal muscle. Diabetes Metab Rev 1988;4:751-772. Goldberg AL, Tischler M, DeMartino G, Griffin G. Hormonal regulation of protein degradation and synthesis in skeletal muscle. Federation Proceedings 1980;39(1):31-6. McMurray RG, Eubank TK, Hackney AC. Nocturnal hormonal responses to resistance exercise. Eur J Appl Physiol 1995;72:121-126. Goodman HM. Amino acid transport during work-induced growth of skeletal muscle. American Journal of Physiology 1969;216(5):1111-5. Goldberg AL. Mechanisms of growth and atrophy of skeletal muscle. Muscle Biology 1972;1:89-118. Goldberg AL, Goodman HM. Amino acid transport during work-induced growth of skeletal muscle. American Journal of Physiology 1969;216(5):1111-5. Goldberg AL. Protein turnover in skeletal muscle. I. Protein catabolism during work-induced hypertrophy and growth induced with growth hormone. Journal of Biological Chemistry 1969;244(12):3217-22. Dohm GL, Hecker AL, Brown WE, Klain GJ, Puente FR, Askew EW, Beecher GR. Adaptation of protein metabolism to endurance training. Increased amino acid oxidation in response to training. Biochem J. 1977 15;164(3):705-8. Goldberg AL, Etlinger JD, Goldspink DF, Jablecki C. Mechanism of work-induced hypertrophy of skeletal muscle. Med Sci Sports Exerc 1971;7:248-261. Goldberg AL, Etlinger JD, Goldspink DF, Jablecki C. Mechanism of work-induced hypertrophy of skeletal muscle. Medicine & Science in Sports 1975;7(3):185-98. Chesley A, MacDougall JD, Tarnopolsky MA, Atkinson SA, Smith K. Changes in human muscle protein synthesis after resistance exercise. J Appl Physiol. 1992;73(4):1383-8. MacDougall JD, Tarnopolsky MA, Chesley A, Atkinson SA. Related Changes in muscle protein synthesis following heavy resistance exercise in humans: a pilot study. Acta Physiol Scand. 1992;146(3):403-4. Phillips SM, Tipton KD, Aarsland A, Wolf SE, Wolfe RR. Mixed muscle protein synthesis and breakdown after resistance exercise in humans. Am J Physiol. 1997;273(1 Pt 1):E99-107. Hasten DL, Pak-Loduca J, Obert KA, Yarasheski KE. Resistance exercise acutely increases MHC and mixed muscle protein synthesis rates in 78-84 and 23-32 yr olds. Am J Physiol Endocrinol Metab. 2000;278(4):E620-6. Miller BF, Olesen JL, Hansen M, Dossing S, Crameri RM, Welling RJ, Langberg H, Flyvbjerg A, Kjaer M, Babraj JA, Smith K, Rennie MJ. Coordinated collagen and muscle protein synthesis in human patella tendon and quadriceps muscle after exercise. J Physiol. 2005 15;567(Pt 3):1021-33. Kim PL, Staron RS, Phillips SM. Fasted-state skeletal muscle protein synthesis after resistance exercise is altered with training. J Physiol. 2005;568(Pt 1):283-90. Cuthbertson DJ, Babraj J, Smith K, Wilkes E, Fedele MJ, Esser K, Rennie M. Anabolic signaling and protein synthesis in human skeletal muscle after dynamic shortening or lengthening exercise. Am J Physiol Endocrinol Metab. 2006;290(4):E731-8. Laskowski R, Antosiewicz J. Increased adaptability of young judo sportsmen after protein supplementation. J Sports Med Phys Fitness. 2003;43(3):342-6. Phillips SM. Dietary protein for athletes: from requirements to metabolic advantage. Appl Physiol Nutr Metab. 2006;31(6):647-54. Kerksick CM, Rasmussen CJ, Lancaster SL, Magu B, Smith P, Melton C, Greenwood M, Almada AL, Earnest CP, Kreider RB. The effects of protein and amino acid supplementation on performance and training adaptations during ten weeks of resistance training. J Strength Cond Res. 2006;20(3):643-53. Willoughby DS, Stout JR, Wilborn CD. Effects of resistance training and protein plus amino acid supplementation on muscle anabolism, mass, and strength. Amino Acids. 2007;32(4):467-77. Ratamess NA, Kraemer WJ, Volek JS, Rubin MR, Gomez AL, French DN, Sharman MJ, McGuigan MM, Scheett T, Hakkinen K, Newton RU, Dioguardi F. The effects of amino acid supplementation on muscular performance during resistance training overreaching. J Strength Cond Res. 2003;17(2):250-8. Anthony JC, Anthony TG, Layman DK. Leucine supplementation enhances skeletal muscle recovery in rats following exercise, J Nutr 1999;6:1102-1106. Tipton KD, Wolfe RR. Exercise-induced changes in protein metabolism, Acta Physiol Scand 1998;3:377-387. Kraemer WJ, Ratamess NA, Volek JS, Hakkinen K, Rubin MR, French DN, Gomez AL, McGuigan MR, Scheett TP, Newton RU, Spiering BA, Izquierdo M, Dioguardi FS. The effects of amino acid supplementation on hormonal responses to resistance training overreaching. Metabolism. 2006;55(3):282-91. Borsheim E, Tipton KD, Wolf SE, Wolfe RR. Essential amino acids and muscle protein recovery from resistance exercise, Am J Physiol Endocrinol Metab 2002;4:E648-E657. S. Busquets, B. Alvarez, M. Llovera, N. Agell, F.J. Lopez-Soriano and J.M. Argiles, Branched-chain amino acids inhibit proteolysis in rat skeletal muscle: mechanisms involved, J Cell Physiol 2000;3:380-384. Long W, Saffer L, Wei L, Barrett EJ. Amino acids regulate skeletal muscle PHAS-I and p70 S6-kinase phosphorylation independently of insulin, Am J Physiol Endocrinol Metab 2000;2:E301-E306.